I cannot think of a Shakespeare play harder to adapt for modern audiences than his early melodramatic and arguably absurd TITUS ANDRONICUS. It's an over the top bloody revenge play set in ancient Rome, with very little by way of character development or nuance, and even the language is poor by his standards. I didn't even bother watching Julie Taymor's adaptation (although this also had something to do with previous bad experiences with her work). That said, I was intrigued by the idea of a new version of the play set in contemporary New Delhi. If ever there was a setting that could perhaps capture some of the corruption and familial super-loyalty that the play demands, perhaps India could provide it. But I am sorry to say that while writer-director Bornila Chatterjee's film looks beautiful and has a fantastic score (DP Nick Cooke and composer Benedict Taylor) - even more impressive on a micro-budget - the film did not capture my attention. The first interesting thing is that Chatterjee and her co-writers - Tanaji Dasgupta and Kurban Kassam - choose to jettison Shakespeare's language. Fair enough, one might say, given that it's not his best work, but that decision further exposes the thinness and absurdity of the plot. There's a lot of justified condensing of characters too - which should make things more straightforward - except that the non-linear presentation and sometimes strange editing choices make it hard to follow again. 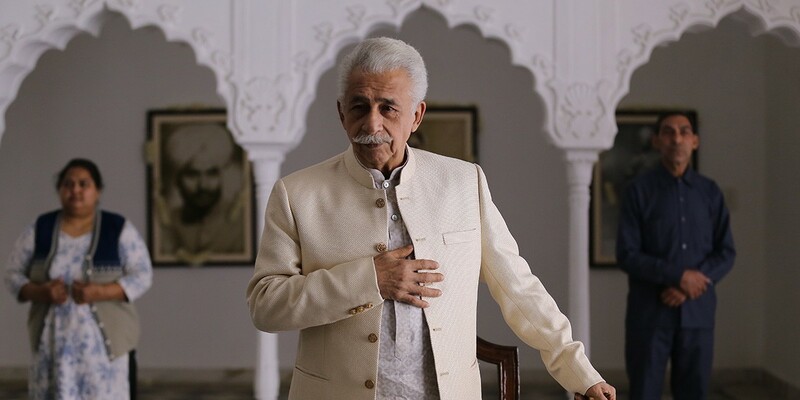 The basic plot is that Tathagat (Naseeruddin Shah - wasted) is a powerful and corrupt businessman. Two years ago he killed his business rival's son and is now set to marry his own feckless son to his business rival's widow Tulsi (Tisca Chopra - very good). Unsurprisingly, Tulsi has not forgotten the circumstances of her son's suspicious death, and with a loyal sidekick decides to use the wedding as a pretext for some murderous revenge. It all goes wrong from the start. Tulsi's newly arrived son Charrag (Antonio Akeel) viciously attacks Tathagat's daughter Loveleen before the wedding. This prompts a hasty cover up and search and heightens the tension. And let's just say things get bloodier and more incredible from there. The problem with THE HUNGRY - and indeed with Titus Andronicus - is that it's very hard to care about any of the characters when there actions are so selfish and seemingly futile. Sadly Chatterjee has not been able to solve the flaw in the original play, and none of her central performances are magnetic enough in their sadistic violence to captivate. In particular, the attempt to shift the focus from Titus/Tathagat to Tamora/Tulsi fails because Tulsi - as written - is too unknowable, distant, alienating. Still, I really did love the way the film looked and felt - at its best it reminded me of the dreamy-sinister school fund-raiser scenes in BIG LITTLE LIES - and I can't wait to see what Chatterjee does with more malleable and profitable subject-matter and a bigger budget. THE HUNGRY has a running time of 100 minutes. It played Toronto 2017. There are still tickets available for the screening at the BFI London Film Festival 2017.